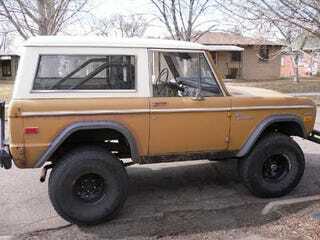 What year Bronco are we looking at here? Well, there's a 302 emblem, and dual fuel tanks, and a blacked-out grille... but these clues don't mean a whole lot when they're on a vehicle that's probably had more than 50% of its components swapped from other trucks during its lifetime. 1970? 1975? You tell us! Kitt has added another well-traveled old truck to our collection of Down On The Denver Street entries; now we've got a Rampage, an IH Travelall, a Dodge Camper Special, and a Cherokee. Make the jump for more photos.